Located in Cuntis, Termas de Cuntis Hotel Castro do Balneario is in the historical district, within a 15-minute drive of Termas de Cuntis and Ponte romana do Río Bermaña. Featured amenities include dry cleaning/laundry services, a 24-hour front desk, and multilingual staff. Free self parking is available onsite. With a stay at this villa in Lloret de Mar, you'll be within a 15-minute drive of Lloret de Mar Beach and Water World. Free self parking is available onsite. With a stay at Hotel Alba in Puzol, you'll be within a 10-minute drive of El Puig de Santa Maria Royal Monastery and Ermita de Sant Jordi. Self parking (subject to charges) is available onsite. 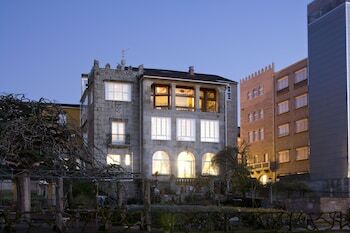 Located in Urduliz, Casa Rural Ortulane is within a 15-minute drive of Sopelana Beach and Castle of Butron. Free self parking is available onsite.